Comprehensive immigration reform is one of the most polemic issues facing the U.S. government and the U.S. population at large. Activists have called for a substantial overhaul of the current immigration system and to replace it with a more equitable and progressive system. Most importantly, advocates are demanding a pathway to legal status and eventually citizenship for the estimated 11 million undocumented individuals in the U.S. This goal has drawn both criticism and praise from supporters and opponents. Some say this plan grants an unfair amnesty to criminals who have knowingly violated U.S. immigration laws, while others argue that it is a plan steeped in human rights and the American dream. 2013 was a tremendous year for immigration reform, although the year will close without action by the House of Representatives regarding a comprehensive plan on immigration. Community and religious groups, activists, workers unions, families and individuals have cooperatively organized throughout the year to put pressure on the U.S. Senate and House of Representatives to pass comprehensive immigration reform bills. In addition, these actors have attempted to raise the discussion of immigration reform to the national level and most importantly, to the national consciousness. These efforts resulted in the Senate passing S.744, the “Border Security, Economic Opportunity and Immigration Modernization Act” on June 26, 2013. According to the Immigration Policy’s Center report, “A Guide to S.744,” “The bill addresses all aspects of the immigration process from border and enforcement issues to legal immigration reforms. It makes changes to the family and employment-based visa categories for immigrants, provides critical due-process protections, increases the availability of nonimmigrant workers to supplement all sectors of the workforce, and provides legal status to 11 million undocumented immigrants within the United States.” There was incredible energy and hope throughout the U.S. because reform was in sight. The Republican controlled House of Representatives remained the largest obstacle and many organizations and activists pooled their energy to reaching the ‘hearts and minds’ of the Republicans. 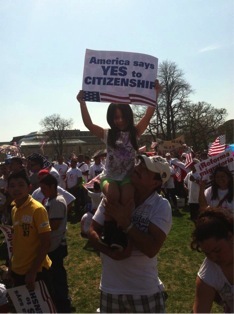 The A10 rally on the National Mall to pressure Congress to pass comprehensive immigration reform bills. Photo courtesy of the author. The A10 Rally on the lawn of the nation’s capital occurred on April 10, 2013. It brought together tens of thousands of immigration reform activist and supporters to demand that the Senate and the House pass comprehensive bills reforming the immigration system. This rally was full of energy and hope and solidified support for the reform movement. Members of Congress and the House such as Senator Robert Mendez (D-NJ) and Representative Luis Gutierrez (D-IL) spoke at this rally and promised that immigration reform would be passed during 2013. The government shutdown, which began at the close of business on September 30 and ended on October 17, had an extremely detrimental impact on the momentum for immigration reform. Most importantly, lawmakers were forced to focus their efforts on questions regarding the budget and funding and the Patient Protection Affordable Care Act (ObamaCare). Immigration Reform took a back seat to these issues. Furthermore, the immigration system itself was stymied, with Immigration Courts closing for the duration of the shutdown while the U.S. Citizen and Immigration Services (USCIS) remained open. This caused tremendous confusion for those in Immigration Court proceedings and those with pending applications with USCIS. The reform movement lost about a month of precious time and support due to the shutdown and the momentum and support had to be regenerated once the government reopened. Just before the full effects of the government shutdown became a reality, House Democrats proposed a reform bill on October 2, 2013. H.R. 15 is based on the Senate’s S.744 bill with substantial changes to the Senate’s proposed border security program. A Guide to H.R. 15, published by the Immigration Policy Center, can be found here. Despite the fact that House Republicans will delay a vote on this bill for the remainder of the year it is impressive that this bill was proposed in the midst of a government shutdown and highlights that there is support for immigration reform in the House given the fact that the bill has 193 co-sponsors. Furthermore, both the Senate and the House appear to be in agreement about a majority of the proposed plans, although there will need to be heavy debate regarding the border security initiatives and contingencies. A major obstacle is that thus far in practice, House Republicans appear to favor a more piecemeal approach to changes to the immigration system versus a complete overhaul. On October 8, 2013, eight members of the House of Representatives, all Democrats, were arrested for “blocking traffic.” They stood in protest with other immigration reform activists on the national mall and on the streets next to the national mall during another rally. The representatives arrested were Joseph Crowley and Charles B. Rangel of New York, Keith Ellison of Minnesota, Al Green of Texas, Luis V. Gutierrez and Jan Schakowsky of Illinois, Raul M. Grijalva of Arizona and John Lewis of Georgia. The protest aimed to put pressure on the House to pass a bill similar to that passed in the Senate. This demonstration made national headlines, especially given the high profiles of the participants and the fact that it occurred during the government shutdowns. Anti-immigrant groups were outraged that the rally was allowed to occur on the national mall which was supposed to be ‘shut down’ given the government’s closure. Inside the Fast for Families tent on the National Mall. A wall covered with messages of support and solidarity for the fasters and immigration reform. Photo courtesy of the author. The movement regained momentum and energy and an organized coalition of faith organizations, immigration rights activists and labor leaders united under the name of Fast for Families. They launched their initiative on November 12 in a tent on the National Mall. Their plan was to fast, completely abstaining from food and beverage, only consuming water, until the House passed a comprehensive immigration reform bill. In addition to those continuously fasting, they partnered with other activists who held solidarity fasts, rallies, events and actions throughout the U.S. Fast for Families gained tremendous support and drew substantial publicity. Four core fasters went without food for 22 days as they tried to draw attention and pressure to the plight of undocumented immigrants and their families throughout the U.S. President Obama and First Lady Obama, Vice-President Biden, in addition to numerous Senators and Representatives visited the faster’s tent and discussed the pertinent need for immigration reform. Members of the Fast for Families movement visited key House offices and spoke to numerous Representatives in hopes that they could affect individual representative’s decisions about reform. 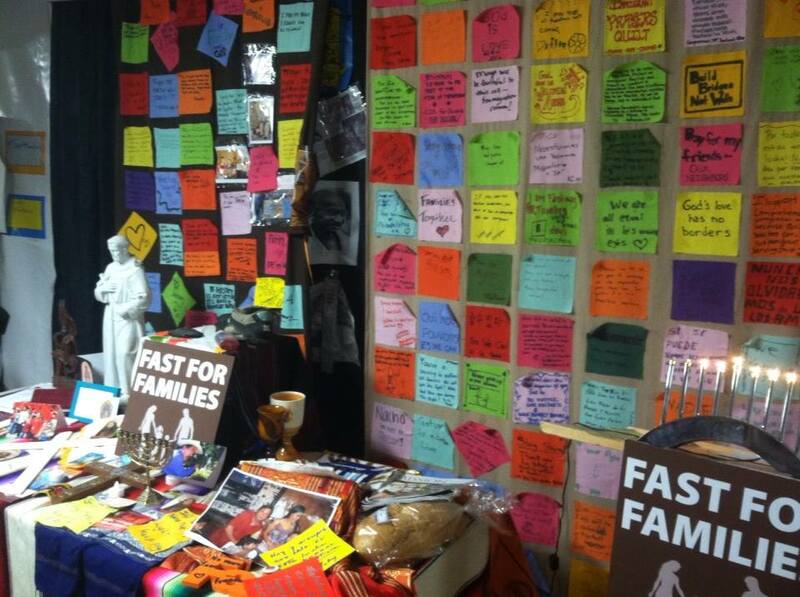 Fast for Families was incredibly effective in mobilizing mass support in DC and throughout the entire U.S. as they they solidified important coalitions and networks of religious groups, workers unions, immigration activists, student groups and the general public. They laid the groundwork and networks for the efforts in 2014. While this is in no way a comprehensive list of all the tremendous actions and efforts for immigration reform that took place in 2013, it is meant to serve as a reflection on the successes that were achieved during the year and the obstacles that still must be overcome in 2014 in order to achieve the desired reform. The reform movement is gaining in strength, numbers and solidarity. More and more organizations, groups and individuals are recognizing their vested interest in comprehensive immigration reform and are applying pressure on their representatives to make this dream a reality. There are numerous ways to become involved in the reform efforts: you can write to your state representative, attend a rally or host a reform discussion or host a solidarity action, among many other possibilities. 2013 saw impressive strides and with great effort and determination comprehensive immigration reform will become a reality in 2014. The opinions and arguments in The Migrationist are exclusively that of the individual contributors and not that of their respective institutions, places of employment, or that of the editors. The Migrationist does not give immigration advice, and nothing in any posts should be construed as such. For immigration advice, please consult an attorney.